Cool grill tools are a good thing. They are fun, and it's also easier to get guys to help out with anything new in the tool category. 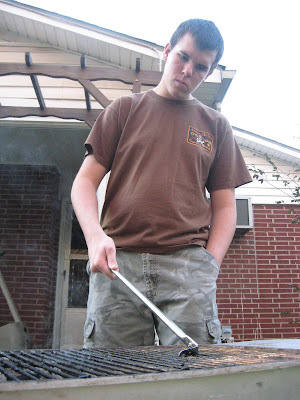 As you can see, my son is cleaning the grill grate. Now, that's not usually a job that anyone likes to do. But, with Grill Floss, it's pretty painless to clean grates, and Grill Floss does a bang up job on dirty grills. Gotta love that. I guess you could say that Grill Floss is kind of like dental floss. It gets where grill cleaning brushes don't. Grill Floss has a metal end that is curved that cups the edges of the grate and really gets the gunk or funk off. 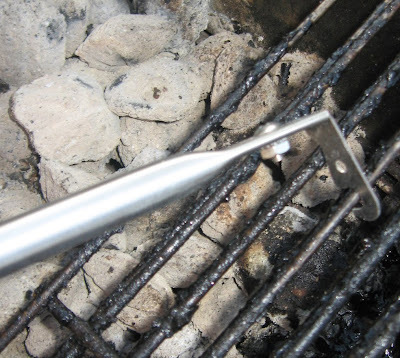 That grill cleaning end can be flipped around for wider grates. The one here you see is for the wire type grill grates, but Grill Floss can be flipped around on that end piece to do the wider grates - mostly on gas grills. My kid is hitting a hot grate here before we start grilling up a pork loin. Bad me. I did not clean the grill the last time I used it. The heat does make it a little easier to use Grill Floss, but it does a bang up job on a dirty grate that is not hot. I've done it both ways, and Grill Floss rocks either way. If you're not sure just what a difference Grill Floss, you can see right here. The first couple of grill grate wires were flossed, and the ones toward the back haven't been flosssed. Big difference. You bet. No. 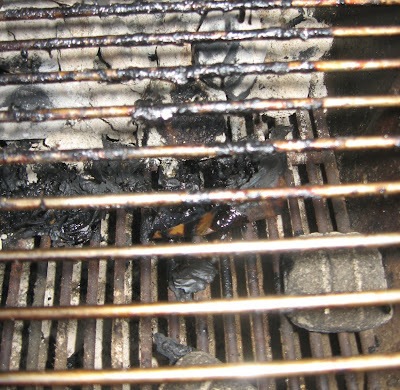 Grill Floss is not like pushing the "self clean" button on an oven. It takes a little elbow grease but very little. I'm not big on grill cleaning myself to be honest, and Grill Floss is the easiest way I've found to have a really clean grill without loads of work. Just slide the tool up and down the grate, and it looks almost new. I was pretty amazed. Check out Grill Floss. It's one of my favorite grill products. Thumbs up! You can also put the grill in a garbage bag with a quart of ammonia it will come out brand new after 24 hours. Works great just make sure you wash it off before you grill up some steaks. Hi Wagyu Beef - Yes. That works well to clean grill grates. Also, Dawn dishwashing liquid which cuts grease does well in a black trash bag esp on hot summer days. Good post, you know how to clean gully grates in Brisbane Queensland?